Linux Mint 15 has been out for a while and so there are already a number of good reviews written about it. 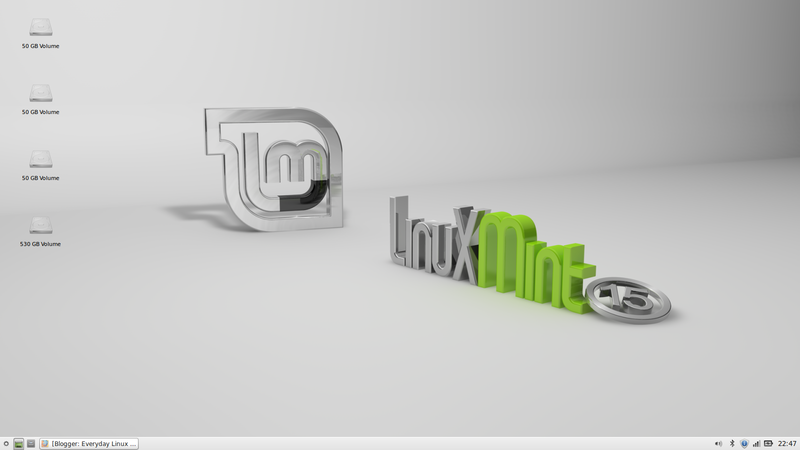 Linux Mint is a very popular distribution and the developers have set out on a different path to Ubuntu in that the emphasis is definitely about evolving the desktop environment as opposed to redefining it completely. The Cinnamon desktop looks very Windows-esque but with a lot of bells and whistles added to make it a top notch environment. Windows users instantly feel familiar with the Linux Mint operating system. Those reviews that haven’t focused on the Cinnamon desktop have reviewed instead the Mate desktop environment which is basically a lighter desktop environment for users who have older hardware or hardware that misbehaves when running Cinnamon. For KDE enthusiasts there is a KDE spin of Linux Mint and even this is covered quite well. It isn’t actually well known however that there is a dedicated XFCE version of Linux Mint. I have been looking again at XFCE recently having written an article comparing Ubuntu and Xubuntu. I simply stumbled across the XFCE version of Linux Mint whilst looking to download Linux Mint Debian Edition for a separate review. So here it is my review of Linux Mint 15 XFCE. 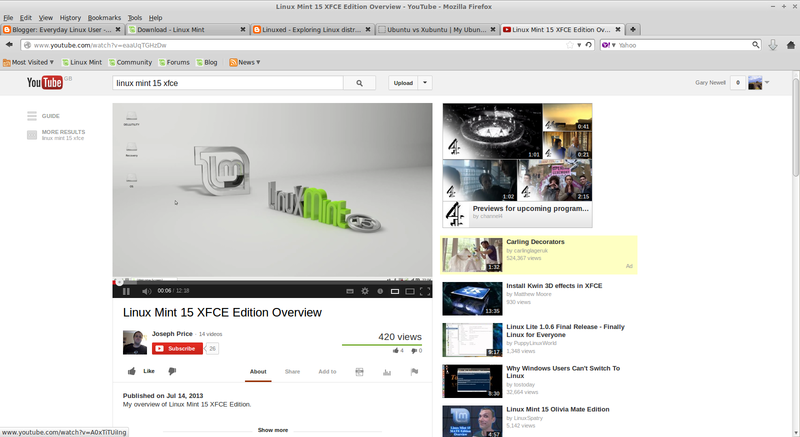 To get Linux Mint XFCE edition I visited the Linux Mint website and clicked the XFCE download link. I then used Unetbootin to burn the ISO to a USB drive and rebooted into a live image of Linux Mint. I performed my usual checks to make sure there were no glaring errors. The general things I test are internet connectivity and tasks that challenge the graphics and audio. Satisfied that everything was working correctly I clicked the install icon and ran through the Linux Mint installer. The install is a simple affair. Choose the language, keyboard, user name and whether to download updates as you go. For me the trickiest part is the partitioning because whilst most users will choose to install alongside their current operating system or to use the whole disk I have my disk segregated into a number of partitions to allow for the fact that I do a lot of reviews and so I have to pick a distro to write over the top of. To be honest I’ve done this so many times now that it is second nature and the system installed without a hitch. 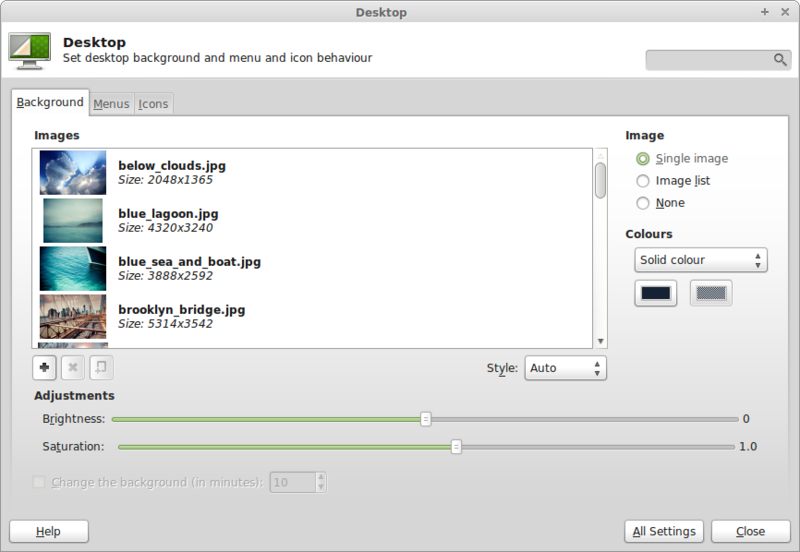 One thing that you will notice across all the versions of Linux Mint is a sense of consistency. Whether you are using the XFCE desktop, the KDE desktop, the Cinnamon or Mate desktops the overall style is the same. The desktop wallpaper is obviously the same across all the versions but the panel at the bottom is also fairly consistent. It would have been easy for the developers to have added extra panels to XFCE and Mate as XFCE and Mate for me work better when there are multiple panels. The whole Linux Mint look and feel is very Windows like. 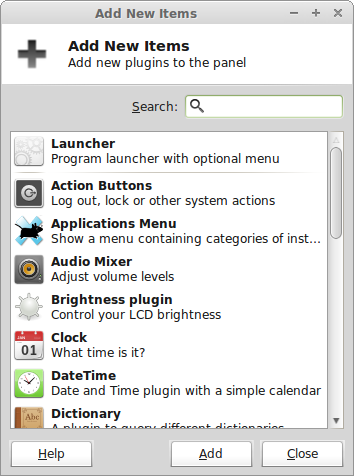 There is the main desktop with icons and a panel at the bottom which shows a menu icon, quick launch icons, open application windows and a system tray. In the bottom right corner is the system tray with icons for adjusting audio settings, bluetooth settings, notifications, wireless settings, battery and power settings and a clock. 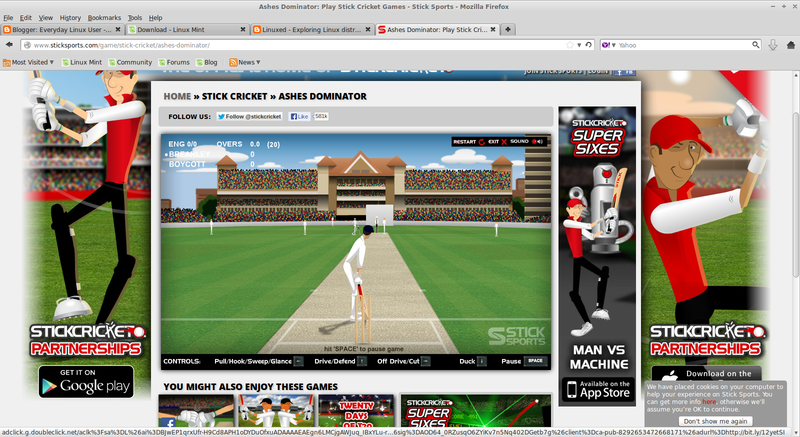 In the bottom left corner is a little spinner icon which is actually the icon that brings up the menu. Next to this are quick launch icons for restore minimised windows and places. The menu used is called “Whisker” which is different to the standard XFCE menu and shows a more Windows like menu. The menu is also very different from the Cinnamon menu. Where the Cinnamon menu is obviously very stylish, the menu used in the XFCE version is very functional. I actually found it easier to use the menu system in the XFCE version than the Cinnamon version. The search bar is very responsive and the categories down the right make it very easy to find what you are looking for. I’m not going to go into the customisation of XFCE too much. You can read my article on customising Xubuntu and this will help for most things you need when customising the XFCE version of Mint. 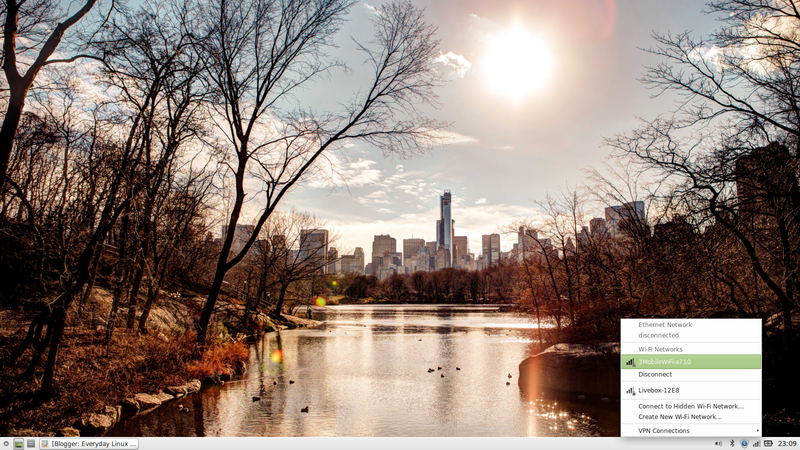 However changing the wallpaper is as simple as right clicking on the desktop and choosing desktop settings. There are a number of different desktops to choose from or alternatively choose your own by clicking the plus symbol and navigating to the image you wish to use. 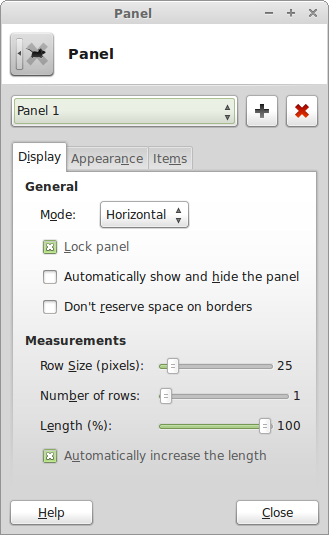 To add a new panel, right click on the bottom panel and select “panel preferences”. Now click the plus symbol to add a new panel. You can then organise the panel as you see fit. You can add new items to the panel by right clicking on a panel and choosing “add new items”. There are a number of items to choose from. The workspace switcher is an essential for me. The launcher item enables you to point an icon to any executable file. If you don’t like the whisker menu then you can use the more standard XFCE applications menu. As expected connecting to the internet was a breeze. Simply clicking on the networking icon on the system tray brings up a list of potential wireless networks. The only thing you need to do is enter the security key for the network you are connecting to. I think the use of XFCE is let down a little bit by Linux Mint because by default they have one panel and for me XFCE works better with the top panel and the quick launch panel at the bottom. (um… Xubuntu then). 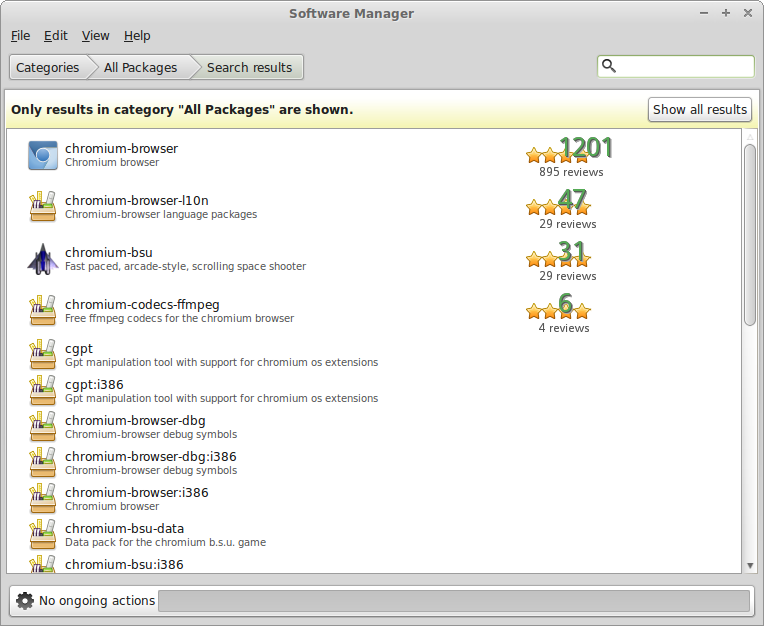 Where Linux Mint comes good is the choice of applications. Don’t get me wrong. I understand the ethos of Xubuntu and why the applications are all lighter in nature but I also like the idea that you can have a lightweight desktop with heavyweight applications. Linux Mint comes with LibreOffice (version 4.0.2.2) which to be honest leaves most other office suites in its wake. (Especially anything that has ribbon bars). 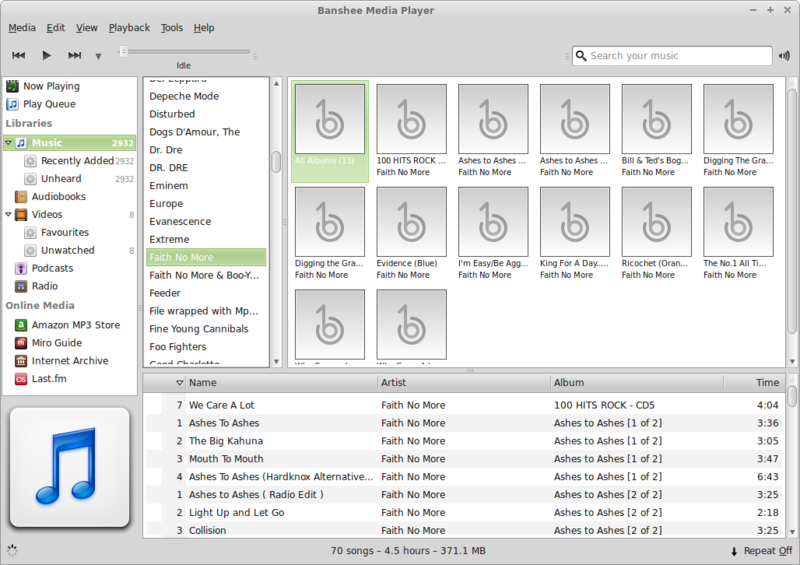 The audio application that comes with Linux Mint is Banshee. Whilst I generally prefer Rhythmbox it has to be said that Banshee is one of the best audio applications available. 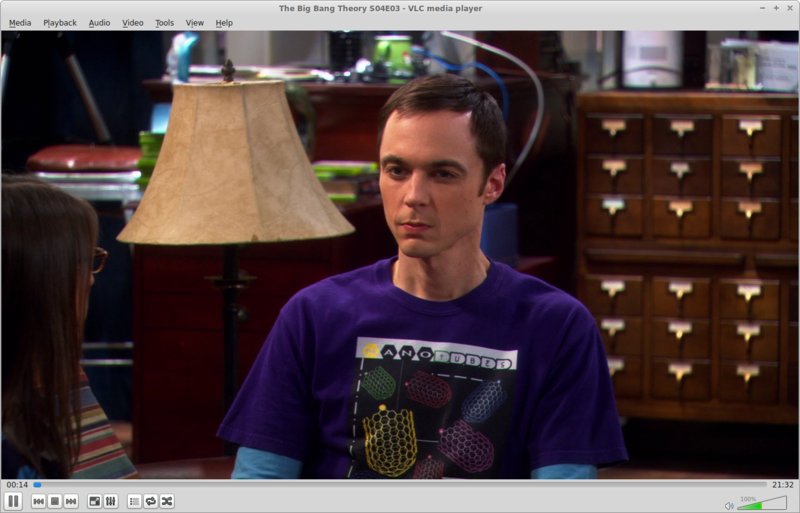 For video playback Linux Mint provides the excellent VLC player. Other packages include GIMP for image editing, Thunderbird for email, Pidgin instant messenger, XChat IRC Chat, Transmission for bittorrents and XFburn for disc burning. The web browser that comes with Linux Mint is Firefox. Without adding any other applications you are pretty much ready to go for the most common tasks. To install applications you use the software manager. The interface is fairly simple to use. In the top right corner is a search box and the rest of the screen is a series of categories. Clicking on a category shows various sub categories and a list of potential applications. By drilling down you can find applications that meet your needs. If you know the application you wish to install then you can enter the name or a description in the search box and a list of applications will appear with ratings next to them. 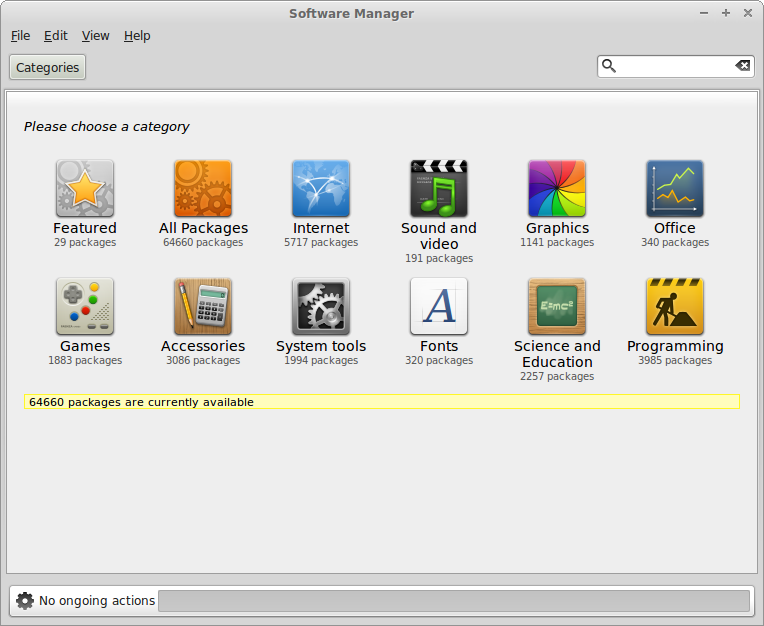 Double clicking on the application in the list shows a description of the software and you are now able to install it. Linux Mint ships with both Flash and MP3 installed by default. Banshee was able to play any song in my collection instantly. I hate it when I install a distribution and get the GStreamer errors. I’m so glad that most distributions have this resolved by default now. As you can see there were no issues playing Youtube videos or playing online games. The Cinnamon desktop is great and if you have the power in your machine I would definitely recommend it for use with Linux Mint 15. The XFCE desktop is a great alternative however and the Whisker menu system works well for finding applications. The XFCE desktop is great if you want to customise your Linux Mint experience and it is so easy to do. With regards to XFCE distributions I would say Xubuntu uses the panels better by default but Linux Mint comes with more cutting edge applications. As an alternative you could try Ubuntu with the XFCE desktop environment. You may have noticed that I haven’t listed any issues that were found whilst using this distribution. I can honestly say I haven’t found any. Day to day use of Linux Mint 15 XFCE gave me no problems whatsoever. This distribution would be great on an older or budget laptop or on a netbook. If you like this blog don’t forget to subscribe by entering your email address into the box provided on the right hand side. Also hang around and check out some of the other articles. There is a reviews page, Puppy Linux page, Raspberry PI Page, top articles page and loads of other articles. If you have something to say about Linux why not start your own blog. Visit GoDaddy.com to find out how. To make it easier for everyone who wants to read my Ubuntu based articles and tutorials I have formatted them, rewritten them and added extra content which has resulted in the eBook “From Windows To Ubuntu”. The book isn’t massive like a SAMS guide so it isn’t going to take you forever to read it but there is certainly a lot of content. Linux: We’re All In This Together Right? Two other Xfce versions I like a lot are Linux Lite (based on Ubuntu LTS) and Voyager. Both show the wonderful potential of Xfce. I find that Xfce may be the "go to" desktop for those wanting a traditional desktop experience. With polishing by various developers it has turned into a very stylish product. I tried Mint 15 version Mate for few days. Package manager always crashed and keep forgetting where I mounted my partition. Back to Mint 14. It's good and stable. The software installation manager is hands down the best reason to use Mint. You can easily install every, and I mean every, good- great- and little used linux apps. Now forget that it crashes if you install too many apps at the same time. The GUI is o.k., I wish they would include a dock and chrome and some other "basic" UI tweaks. Good intro to XFCE Mint 15 – I'm running from persistent Live USB, and it's quite snappy – won't put a 9 month support distro on my HDD. The only real head-scratcher is that NTP for internet time is not pre-installed to keep the clock up to date. I tried Xubuntu Raring, but spent too much time changing the preinstalled software – Mint has always preinstalled the most of my own first choices for software – and didn't care for the bar on top, launcher on bottom. Note that right-clicking the empty desktop brings up the XFCE full menu, along with the taskbar Menu launcher. How did you generate the persistent Live USB? I need to migrate from XP, and persistent Live USB seems an excellent way to avoid premature commitment. Just thought I'd mention (if you didn't already know) that LinuxCon North America 2013 is coming in Sept & schedule that just came out includes at least a couple of presentations about desktops & window managers. Also seems like recent releases of top Linux distros include better support for running in a VM (Virtual Machine/Appliance in VMware/VirtualBox). Instead of having to go thru the extra step of installing guest additions or tools, there either not needed or already installed and configured. I've been running Fedora 18 XFCE & Linux Mint XFCE in VMs w/ few problems and just 512MB RAM. Obviously desktop, window manager, and browser are biggest memory hogs in VMs for "casual" (non-programming/server use). 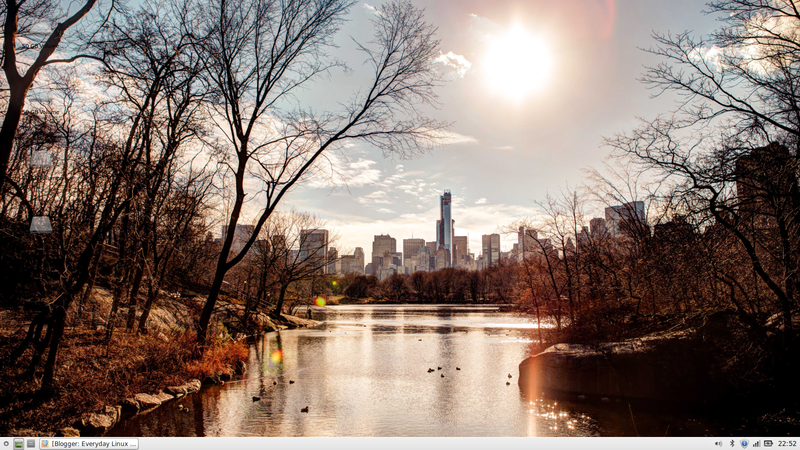 Well I couldn't figure out adding the Wallpaper on XFCE, but yeah, after adding LXDE core it came up beautifully, thank goodness Mint LXDE lives again! Tried the live DVD, no sound. Did some searching and found that SB Z is not supported due to Creative not releasing drivers or info. Fair enough, so took out SB Z and wanted to use realtek on-board audio instead. Hmm again no sound. I am using optical cable but all I get on LM 15 is silence……… guess it is back to windows again. 🙂 I see myself testing a Linux distro every so often, but till now none of them come without issues. I guess that with the release of SteamOS, the game support will change a tad. Great review. I had a Samsung N150 running Windows 7 Starter and the OS turned it into a useless paperweight. I'm installing Mint as I write this. A good review as far as it goes. Dinging a distro for issues that are Trivial to change is just Dumb. The first thing that Newbies must be taught is to Customize The Panels – it is as easy as a right click in XFCE or LXDE. Don't be a slave to the default 'Start Menu'! BTW the Whisker menu is a fine complement since it can also be easily customized to your needs. have you EVER tried to install a local network with more than 2 computers? LOL. like pulling teeth. Does ANY distro have an easy connect…without requiring one to be a geek?? To connect computers to internet, the easiest is to use a router with DHCP. No setup then on your linux boxes. For sharing folders, i use SAMBA, which lets me share them on linux and windows. Very easy.